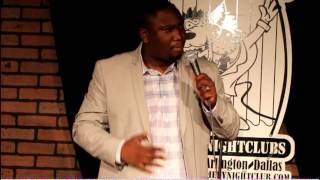 Comedian Alfred Kainga started doing stand up comedy on the local Texas comedy scene in 2006 but turned professional in 2010 after he had caught the attention of comedy club managers and promoters who started booking him on a regualar basis. Originally from the southern African country of Zimbabwe, Alfred Kainga has been able to create his own unique style of comedy that is complimented by his African heritage which he talks about in his routines combines with his experiences of living in the US for the past 16 years. In 2014 Alfred was a finalist in the Funniest Comic in Texas competition and also just filmed his first tv spot for Comedy Central. Alfred can be seen performing regularly at the Improv Comedy Clubs and Clubs across the country.